Updated on Jan. 24 at 6:15 p.m. | President Donald Trump issued his first executive orders Friday and Tuesday. Executive orders date back to George Washington’s presidency. They’ve been used to bypass Congress when the president believes he has constitutional authority to take action on his own. As of Tuesday, Trump had signed two executive orders, though Press Secretary Sean Spicer said the president has plans to issue more. The president has also issued eight executive memoranda since taking office, lesser known but largely carrying the same power as their better-known cousins. 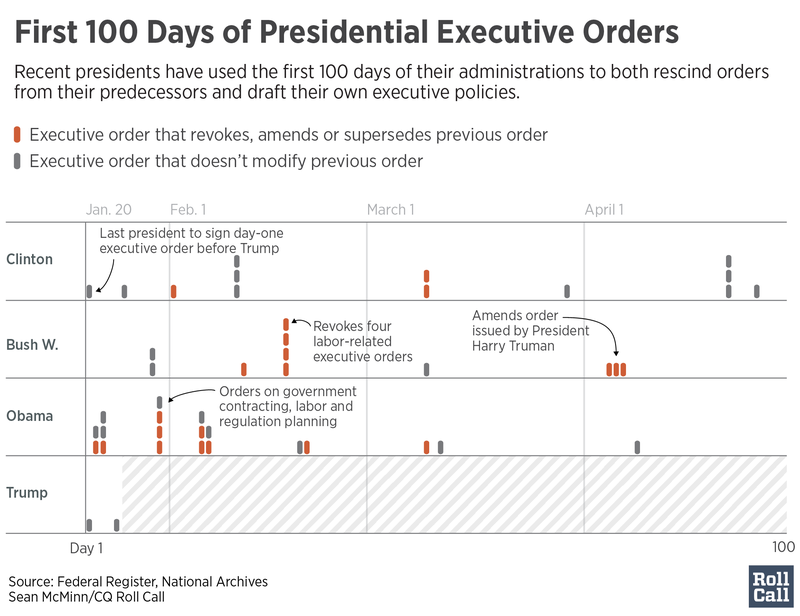 In the three most recent administrations, presidents have each signed an average of 14 executive orders during their first 100 days in office. Tuesday’s order was a directive to expedite environmental reviews and identify “high priority” infrastructure projects. The order he signed on Friday gave instructions to “minimize the unwarranted economic and regulatory burdens” of the 2010 health care law. President Bill Clinton was the last to issue an order on the day he was sworn into office. The order set ethics guidelines for executive appointees. Below is a complete list of the titles for all executive orders issued by recent presidents in their first 100 days, as published by the National Archives and Federal Register. Click on a column header to sort by that column.